a layer 2 protocol used to prevent loops, it prevent only layer 2 loop (switches loops). the reason behind loop is the redundant links or the circle topology between switches. we use redundant links to avoid link failure. spanning tree can take down the whole network, if not implemented correctly. best accumulated Path to the root bridge. each link is a connection between 2 switches. apply same roles as electing root port. switch 2 E0/1 stay forward. if you new to spanning-tree and don’t understand the terms, don’t worry. i am just giving you an idea by this. The previous example is what happened. the rest of the article will explain how this happened. its not a fixed time, but instead its the hop count and each switch add 1 to the age . there are ways to avoid such long period, I will mention them in the enhancements section . for cisco switchs only, cisco switches don’t run the normal 802.1D which runs 1 instance for all vlans, instead they made the PVST which runs a different instance for every vlan. each vlan traffic flow is different from the other vlan, that depened on where is the root bridge for that vlan. on trunks those BPDUs are encapsulated in the ISL header, which has the vlan ID + BPDU flag. at the time only Cisco switches had trunks , which is ISL Trunk . this cisco multi-cast address will allow the flooding of PVST+ across non-cisco switchs. the original PVST wasn’t supported by 802.1Q Trunk protocol . enhanced version of spanning tree to speed up convergence by introducing the concept of proposal and agreement. at 2004 802.1D-1998 has been removed , and 802.1W + some addtions is now called 802.1D-2004 . !! strange !! Cisco again made it’s switches run a different instance of 802.1w for each vlan. all the traffic between accounting and human-resources will go through sw-1, because the link between sw-2 and sw-3 is blocked. for such simple topology and since we have 3 root bridges. we are going to make reallocation we want. to draw the flow diagram we have to make 3 drawing, 1 for each vlan, here the traffic flow. Click on the image then zoom if you want. from the drawing you can see that each port will have 3 stats, which depend on traffic, if the traffic is going to vlan 2 so the link between Sw-3 and Sw-1 will be block , if it’s going to Vlan then the link between Sw-2 and Sw-2 will be block. when you choose the root bridge placement you consider the traffic flow . when a link fails, the switch will take up to 50 second to recover. but the mac-address table entries will take 5 min. instead of going through listening and learning, the port will go to forwarding immediately. this point is the most important, because if your access-ports cause TCN when ever you connect a host, your entire network can be congested from the flooding of unicast frame that has no entry in the mac-address table because of the 15 second max-age. better to use this feature as you can. can cause a loop if you connected a switch to unprotected port. if a switch has port and this port stats is blocked, and if for some reasons the BPDU comming to that blocked port stopped, this port will go to forwarding state, and if the reason stop is bidirectional problem then a loop will occur . the loop guard will keep the port in the blocking state. Require at least 1 blocked port . Change the blocked port immediately to be root port and save 30 second of learning and listening . if SW1 is connected to other switches that send frames to SW2 , it will be sent to E0/1 which is down. thus SW2 will flood those multicast so SW1 know that those addresses are at E0/2 not E0/1 . when the E0/1 comes up, it will take 2x forwarding-delay (30 second) + 5 second( cdp/ ether…etc) for the port to reach the forwarding state. instead of waiting MaxAge-MessageAge to move a blocking port from blocking to listening the switch will save that time (~20 sec ) and move the port directly to listening . must be activated on all switches , or RLQ will not be responded . priority 0 will become the root if it has lowest mac-address when there is another switch with priority. to make non root switch be the root bridge with out adjusting priority. the switch will set the its priority to 24576. and declare himself the root bridge. is such case the switch will change the priority to next lower one to win . if the root bridge has a priority of 0 and you tried to apply this command you will get error message. if we again to sw-3 and re applied the command, the priority will go to the next lower step. % for some (or all) of these instances to zero. this command will adjust the priority of a switch in case the root bridge failed that switch take over. this command is very tricky, because it will set the priority to 28672 .
if the root bridge priority is 32768, then the switch with the secondary command is now the root bridge. and if you are running common spanning-tree you might cause 30 second outage. the command assume that switches other than the root is 32768 so it choose 28672 to be the backup as if the root is lower than this. Before we start you have to know the IEEE runs 1 STP instance for all vlans, and cisco runs a different instance for every vlan . i will talk more about this in the PVID inconsistency section. at that time 802.1Q wasn’t there and ISL was the only trunk that exist . IEEE made 802.1Q and now it’s problem for cisco when 2 cisco switches are connected via IEEE switch. The IEEE switch runs 1 instance while the cisco switch want to send a BPDU for each instance. 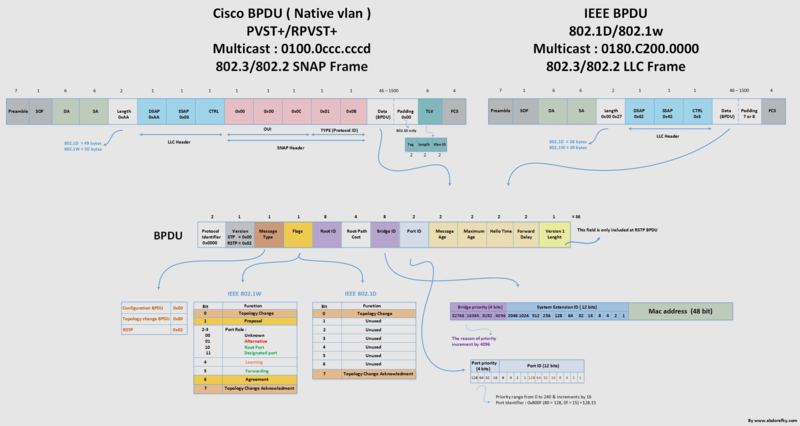 Cisco will send IEEE BPDU to 0180.C200.0000 (Untagged) and cisco switches know that this IEEE BPDU belong to vlan 1.
now PVST+ frames are tunneled accross IEEE region, and from PVST+ point of view : that IEEE region is a like a wire. Spanning-Tree BPDU flow & convergence . it’s a frame, that contain the root bridge information and the switch information . determined by the speed of that port. the sum of all links costs to reach to root bridge.